Complaint Result: CIVIC’s complaint resulted in the County of Hudson appointing a committee of attorneys and doctors to investigate CIVIC’s complaint. In response to CIVIC’s continued pressure on the county, the County of Hudson created by local resolution the first medical oversight committee in the immigration detention system comprised of advocates. Sixty-one women and men in the custody of U.S. Immigration & Customs Enforcement (ICE) at the Hudson County Correctional Facility (HCCF) in New Jersey have filed a civil rights complaint against Hudson County and ICE. 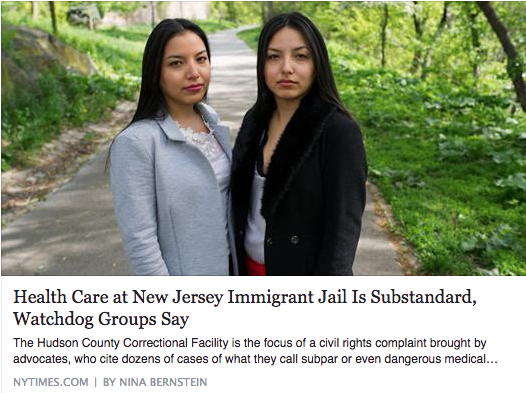 Community Initiatives for Visiting Immigrants in Confinement (CIVIC), a national network of volunteer-run groups that visit and monitor immigration detention facilities, along with local visitation program First Friends of New Jersey and New York filed the complaint on behalf of the women and men. The groups are urging Hudson and ICE to recognize the lack of proper medical oversight and work with the groups’ board of independent medical observers to address the health crisis at the immigration detention facility. The complaint details a pattern and practice of substandard medical care, resulting in delays in cancer diagnoses, rapid weight loss in diabetic patients, a current and ongoing outbreak of a fungal or bacterial infection, illegal co-pay charges, and more. Since January 2014, 121 individuals under the custody of ICE have submitted medical grievances directly to Hudson, but Hudson only took corrective action in 2.48% of these complaints. Since January 2014, 560 individuals in ICE custody at Hudson were transported to an outside hospital. Of those, 33 percent of them were hospitalized due to medical emergencies, including Nelson De Jesus Fernandez who almost died due to a blood clot near his heart. Hudson County contracts with the federal government to detain approximately 476 immigrants per day, being paid a total of $110 per person per day. In 2015, Hudson detained a total of 3,111 immigrants for ICE. The facility has been operating as an immigration detention facility since April 1996. The facility operates under the 2008 Performance Based National Detention Standards, despite the fact that there is a more recent set of Standards created in 2011. “ICE continues to needlessly detain people with severe medical and mental health issues and fails to provide adequate medical and mental health care for them, causing unnecessary human suffering,” said Sally Pillay, Program Director of First Friends of New Jersey and New York. CIVIC obtained the above data on grievances through a New Jersey Open Public Record Act request.